With the release of Harry Potter and the Deathly Hallows Part 2 upon us, I thought what better way to welcome it than to review the first instalment. As with most movie tie-ins, Deathly Hallows Part 1 left something to be desired, however for Harry Potter fans, it's definitely one not to miss. The game follows the same path as the movie for the majority of the game, and also includes some parts which aren't in either the book or the movie. Differing from the previous Harry Potter games, Part 1 is more of a third person shooter; instead of a gun you have a wand. As mentioned above, Part 1 is mainly a shooting game, you have numerous spells, each with different properties. Some examples are Stupefy, which stuns its targets, Expelliarmus, which disarms enemy wizards and Protego, which creates a barrier to defend the caster temporarily. As well as an array of spells, Harry can take cover during fights, which adds to the feeling that this is a different skin on something such as Gears of War. There are times when you are meant to use stealth instead, and this is where the Invisibility Cloak comes into play. The cloak has a detection meter in the corner. If you move continuously or bump into people it goes down, as you are closer to being discovered. This is easily fixed though by standing still for a while, allowing it to go back up. For those who enjoy challenges, the main menu has a challenge section, where you can race against the clock or rack up points in the various challenges. 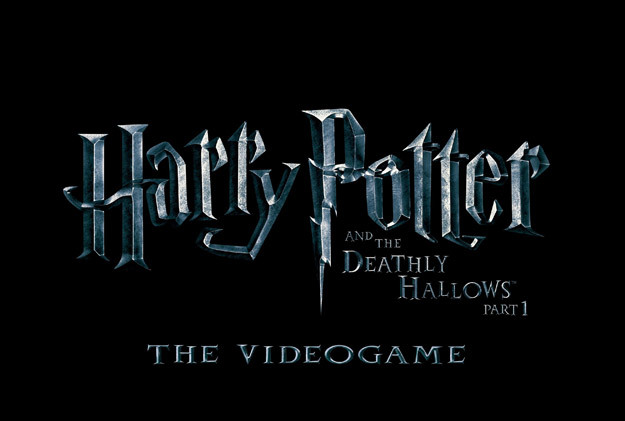 In previous Harry Potter games, there were mini-games and puzzles to play with. Deathly Hallows is where Harry, Ron and Hermione are on the run, so the puzzle aspect is gone. It's for the most part, run then combat then repeat. 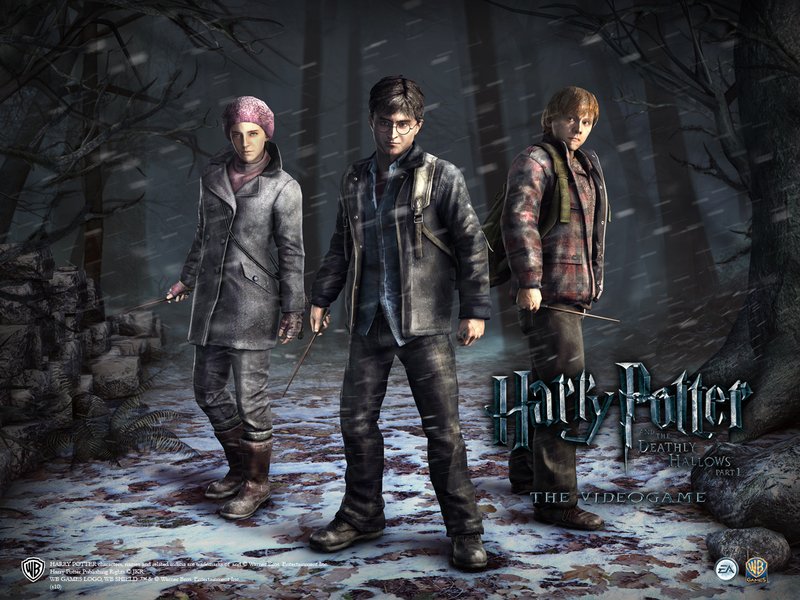 However to gap the space between chapters (such as when Ron and Hermione are setting up camp or finding information) the player is given missions to do. These generally are defend and save muggle-borns. While this fits into the overall story, it was not part of the book or movie. There is even one mission where Harry is in a dragon cave and you have to get out, which makes little sense when it is meant to be a movie tie-in. The game does offer collectables to discover on your journey which other than the Deathly Hallows symbols, are found in suitcases hidden around the areas. These offer parts of the story as told in the books, which is a nice addition. These aren't the best graphics in the world, but you can tell who is who which is what matters. The spells do vary in how they appear and also how they are cast. This is a good thing as it would be a let down if three spells fired exactly the same colour, shape and speed. I found that the scenery looked a lot nicer than some of the characters. At times the voice-overs sound too forced. For a good solid voice-over, you need to feel like you are in the moment and how the character would react and in what tone of voice. This lacked in Part 1, but with the amount of combat involved, it went by overlooked. Some of the cast of Harry Potter gave their voices to their respective characters, such as Rupert Grint (Ron Weasley), James and Oliver Phelps (Fred and George Weasley) and Evanna Lynch (Luna Lovegood). It was a shame that others such as Daniel Radcliffe (Harry Potter) and Emma Watson (Hermione Granger) were missing from the list, but in honesty, it is hard to tell it is not them until the credits roll. Overall, Harry Potter and the Deathly Hallows Part 1 would be a poor choice for non-Potter fans, however I do recommend it if you are a big fan of the series. Whilst it has similar issues to other movie tie-ins, it's also enjoyable enough to play through a few times. I give this game 5/10, and I hope that Part 2 improves its standard to be an excellent finale. A note to anyone who aims for 100% achievement completions, Deathly Hallows Part 1 does have a Kinect feature and Kinect achievements, so if you are without the device, it will put your completion stat down slightly. One other thing which is technically not part of the game is the cases for both Part 1 and 2 have an augmented reality experience. What this means is you can download the program from the video games website, and hold the case up to the camera. This causes a 3-D representation to appear. It moves and casts a spell, providing a code for the game. Just recently picked this up myself mainly for the kinect stuff, i will try and get into it soon though and see what its like, for me though EA ruined the harry potter series afer the 2nd game because it was so much fun to go visiting and free roam around hogwarts. After the 2nd they was all just linear games. Im not expecting much from this game but i will give it a fair shot. Just recently picked this up myself mainly for the kinect stuff, i will try and get into it soon though and see what its like, for me though EA ruined the harry potter series afer the 2nd game because it was so much fun to go visiting and free roam around hogwarts. After the 2nd they was all just linear games. Im not expecting much from this game but i will give it a fair shot. I think that my sons and I will stick to the Lego HP games. I find those to be much more enjoyable and I feel I get my moneys worth time wise.